Space is one of a university’s most valuable commodities. Renovation and new construction projects affect space allocations on campus. The provost is the ultimate authority on the administration of space at Ole Miss. 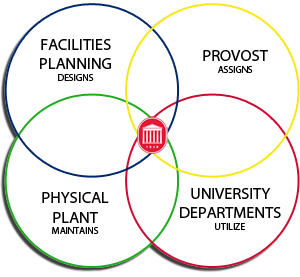 Facilities Planning works with the Provost’s Office to try and find the most appropriate space for each department. Questions or comments about space issues should be directed to the Provost’s Office at 662-915-5317. If you need more space, you can complete the Additional Space Request form. The Facilities Management Department maintains all spaces on campus. Please feel free to submit a notification in SAP if you have a maintenance need.